The Knobbly Cob Sandwich Bar is based in the middle of Westgate Street in Gloucester town centre and has become one of Gloucester’s favourite sandwich shops. Established in 1997 we have an unrivalled reputation for a fast and friendly service. 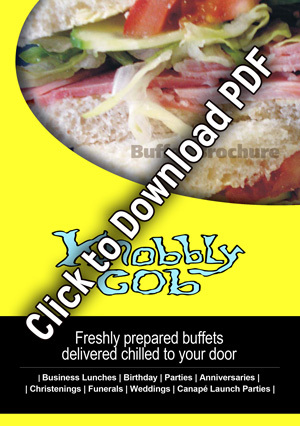 Whether your looking for a quick lunch or a delivered Buffet you will always find high quality, freshly made Lunches. 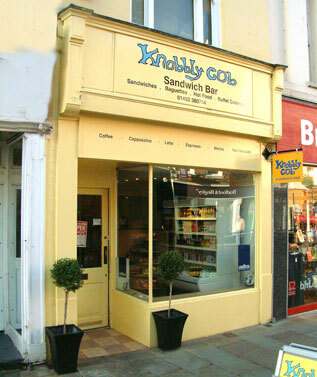 Here at the Knobbly Cob we offer a range of items all made to order which include Deli sandwiches, Baguettes, Ciabattas, Sub rolls, Jacket potatoes, Salad Boxes. We also have hot specials on each day which include things like Hot Roast Pork Apple sauce and Stuffing, Lasagne and salad, Pasta Bakes, Roast Turkey with Cranberry sauce and Stuffing and many more. See our specials board each day to find out what we have on. We also have a great selection of Hot and Cold drinks available to takeaway or site out side and watch the day go by!! We make Fantastic Cappuccino’s, Latte’s, Americana’s , Hot Chocolate’s or a good old English tea. We also have a good selection of Cakes available to tempt you in to that naughty treat with our most popular being the Caramel Shortbread. We frequently provide catering for private functions which include Weddings, Funerals, Christenings Birthday Party’s, Business Lunch’s and Corporate function’s. Buffets can be Themed to meet your needs. We can produce Vegetarian , Vegan, Gluten Free or local which is produced using Gloucestershire Produce. Why not give us a try and let us know what you are looking for by using the contact us button and we will call you to discuss your requirement’s. We can also give you a quote if you want to have something different to the set menu’s you can find here on our web site. Contact us to find out what we can offer you for your special day or event . We provide this wide range of buffet catering , Dinner packs, Finger food and Boxed lunches all at affordable costs.